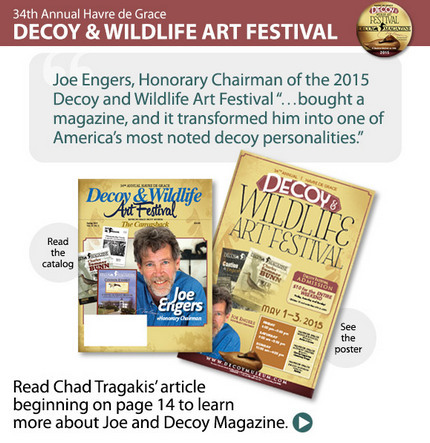 Decoy Magazine is published bi-monthly plus an annual Year In Review. Our publication serves the interests of decoy collectors worldwide! We provide exclusive information on decoys and makers from the golden age of waterfowling as well as comprehensive coverage of decoy auctions, shows and events. We take the collector/business person into the heart of the decoy market! Each issue is printed on a quality white coated stock with the typical issue consisting of 48 pages. We offer both black and white and full color process advertising throughout each bi-monthly publication. If you are interested in placing an ad, please call our advertising office at (302) 644-9001 or e-mail our publisher at decoymag@aol.com. Contributing Photographer: Henry Fleckenstein Jr.
Decoy Magazine (ISSN 1055-0364) (USPS 004192) is published bi-monthly plus an additional issue. Copyright 2017 by Decoy Magazine, 1143 Savannah Rd., Lewes, DE 19958. All rights reserved. No material in the printed magazine or within this website may be reproduced without the written permission of the publisher. All subscriptions must be paid in advance. Periodicals postage paid at Lewes, Delaware and at an additional mailing office. Address changes should be sent to: Decoy Magazine, P.O. Box 787, Lewes, DE 19958, (302) 644-9001.